There are many synonyms for ‘bugs’ in the software and technology industry and no, I’m not talking about creepy crawlies. Some refer to them as ‘defects’ or ‘faults’, while others simply categorise them as ‘issues’ or ‘glitches’. In the end it doesn’t really matter what you call them, what matters is how you deal with them. Lots of digital-first companies in today’s business world deal with website bugs with what we call bug tracking tools, or issue tracking tools. These are systems that enable digital teams (including developers, digital marketers, web analysts, etc) to report, manage, track and resolve bugs. In this blog post, we will take a closer look at 17 of the most popular bug tracking tools out there – identifying the different features that set them apart as well as what types of companies and/or roles they are intended for. 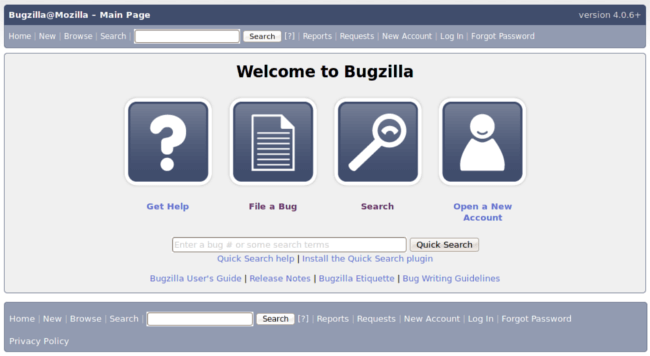 Originally created by the Mozilla Foundation, Bugzilla is a popular, open source bug tracking tool used by a wide range of organisations. Although considered one of the more minimal bug tracking systems out there, it has an advanced search system and a highly comprehensive reporting tool that can generate charts and automated scheduled reports. Additionally, it offers a safe environment for discussion among team members. BugHerd is a web-based issue tracking project management tool. Intended for developers and designers, issues are organised around four lists: Backlog, To Do, Doing and Done – enabling teams to keep up with the status of various tasks. The tool captures a screenshot of the issue including the exact HTML element being annotated. Already have a tool such as Redmine or Pivotal Tracker? BugHerd can be integrated with either of these. Mantis Bug Tracker (BT) is an open source issue tracker that has been around for quite some time now. It is a very easy-to-use tool that comes in the form of a web application but also has a mobile version. Implemented in PHP, the installation process is very simple. To demo their software, you can check out their own internal bug tracker. The Bug Genie is a project management and issue tracking tool with an easy-to-use web interface. Users can easily locate issues in The Bug Genie using filters and custom issue fields. Additionally, users can add issues and perform tasks on issues without even opening them. This tool is not free however when hosted, users can sign up for a free trial. DeBugMe is a visual feedback tool that has a built-in bug tracking solution. Using a toolbar, users can easily annotate the page in view by drawing, highlighting, blacking out certain areas or even dropping a pin. In terms of project management, this tool is great for small teams. DeBugMe can be integrated with a wide range of other tools, including Jira, Trello, Pivotal Tracker or Visual Studio. zipBoard is a popular tool used to review and collaborate on websites. It’s easy to get started using this visual bug tracker as the user only needs to enter their website URL or start uploading mock images. Additionally, zipBoard has a central task manager that enables users to easily track issues and share with team members. Integrations with JIRA and Slack are available. DoneDone, another grandfather to issue tracking, provides simple workflow, easy filtering and flexible issue management for it’s users. Requiring no installations, you can also receive real-time in-app notifications that pop up right in your browser rather than your inbox. Additionally, DoneDone enables users to test issues in one click using release builds. With this tool, users can convert screenshots from any website into a powerful bug report directly into your existing tools. 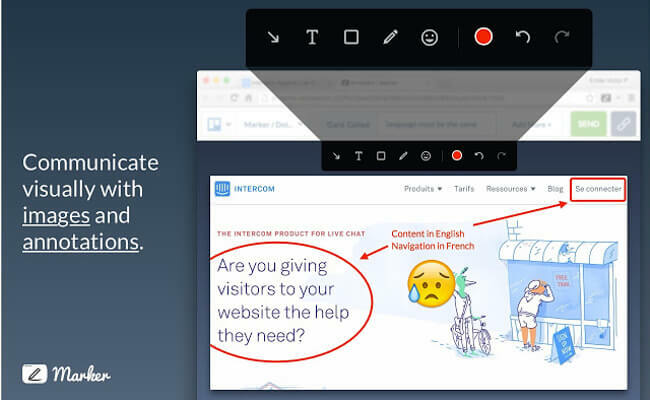 Key features of Marker include screenshot annotation tools, shareable links and workflow integration. The tool can be integrated with tools such as Jira, Slack, Trello and Github (scrum and project management tools). Stryka is an enterprise test management tool of Plutora that is geared towards Test and QA teams. This cloud-based software provides users with real-time dashboards and reports and is built to support multi-disciplined testing practices. It can easily be connected with tools such as JIRA, Selenium and Rally. 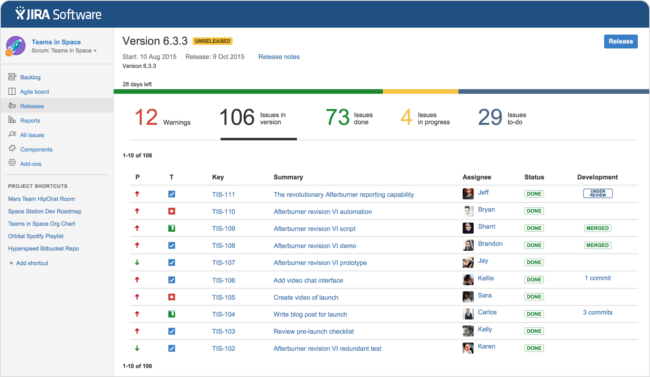 Developed by Atlassian, JIRA is a very popular project tracking software. This tool provides the full set of recording, reporting and workflow features, as well as code integration, planning and wiki. With its robust set of APIs, JIRA can be integrated with almost all tools your team uses. FogBugz, created by FogCreek Software, is a web-based bug tracking system that allows users to create, list and assign ‘cases’ (or defects). Users can follow the progress of these different cases using different milestones. It also allows you to create wikis that are available to the general public. BugHost is a web-based defect tracking system that caters to both large and small-scale companies. The system offers a service called WebHost that you can use to enable end customers to create issues themselves that go directly into your project. Additionally, BugHost allows users to link similar bug reports together so that in viewing one report, you can easily review the others. Sifter is a bug-tracking tool geared towards (smaller) teams that are less tech savvy. Similar to FogBugz, users can sort issues based on different milestones within the project. Although screenshots cannot be made using this tool, logging issues and updating your team on the status of said issues is quite simple. 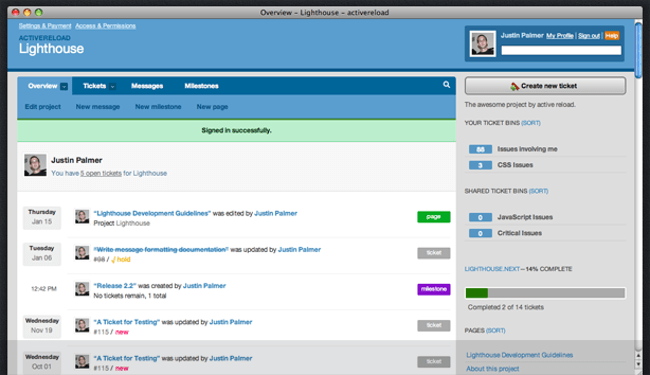 Lighthouse is another easy-to-use, web-based issue tracker. What’s great about this tool is that users can store project documents online in its interface. Additionally, users can create and tag issues which are automatically categorised in the system. Thanks to Lighthouse’s robust API, it can be integrated with other tools such as Beanstalk, GitHub and AirBrake. Zoho Project’s issue tracking module, Zoho Bug Tracker is a great online tool if you’re looking for complete visibility of unresolved issues. Users can define a cycle that manages issues based on stages. They can also automate reminders & notifications so that team members are aware of which issues must be looked into. This “full-stack software project management tool” contains a bug tracking system that is mainly intended for developers. 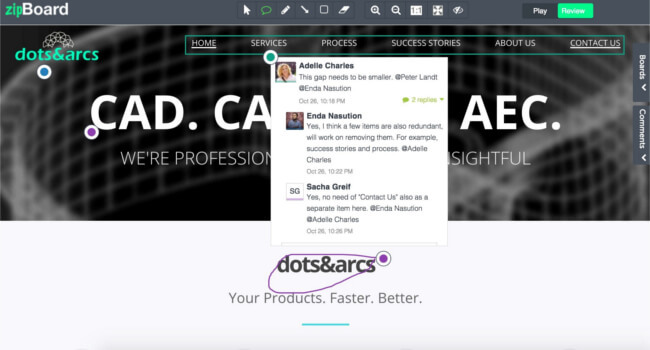 Users can easily collaborate with team members through online messages, wikis and comments. The software also includes easy-to-use task boards for organising tickets (by milestone). BugAware is a fully-customisable bug tracking tool in which users can define task types, statuses of issues and prioritise workflow items. Users can also restrict projects from particular users if needed. 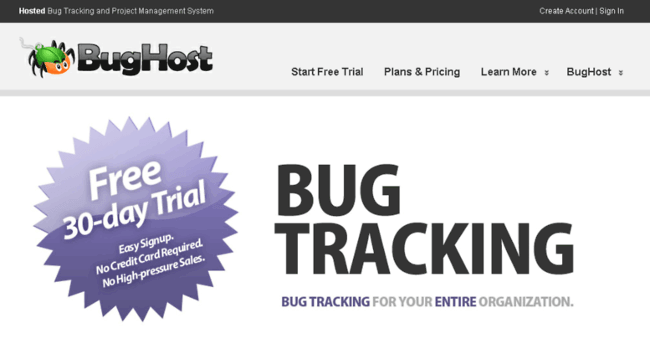 This tool can be either hosted by BugAware or installed as an application that can be hosted by the user himself. In order to choose the right tool, it’s important to consider factors such as your team’s size and how many capabilities you require. For example, smaller teams who are not looking for built-in project management capabilities may want to select a tool that is more simple and focuses on bug tracking activities alone. Alternatively, if your team is in search of a more robust solution, these all-in tools might be the answer. We hope this overview of tools provides you with some inspiration in finding a suitable bug tracking tool. If you have any suggestions or know of other bug tracking tools, please feel free to put them in the comments below!